The best regions in Australia to target barramundi are the Northern Territory, the west side of Cape York Peninsula down to the lower Gulf of Carpentaria coast, and the WA Kimberley. Of these regions, the Northern Territory offers the best combination of pristine habitat and accessibility. The best barramundi rivers have unaltered floodplains that hold an “inland sea” of water during the wet season, letting the water slowly drain away after the wet season, leaving a series of permanent waterholes. On the East Coast such rivers did exist, but were long ago transformed by dams and weirs, and their floodplains drained, severely affecting the barramundi populations, as barramundi require free passage from freshwater to salt each year. Barramundi can be caught in tidal rivers, freshwater lagoons, and along coastal foreshores. They are a hardy and adaptable fish that can be found almost anywhere along the coast, although their preference is for turbid water and muddy creeks and rivers, rather than clear sandy waterways. Barramundi tend to congregate in certain areas with the changing seasons, but can be found in any of their usual habitat at any time. Fishermen who target big barramundi tend to fish the lower sections of big NT tidal rivers such as the Daly, Mary, Adelaide, and East and South Alligator Rivers, and some coastal creeks. Most big fish are caught just after the wet season. Close to Darwin, the harbour is an excellent spot for smaller barramundi, as is nearby Shoal Bay and Bynoe Harbour. Anywhere with mangroves and tidal creeks, barramundi won’t be far away. A bonus in the NT is that gill nets have been banned from many areas. Barramundi live in a great range of habitats and therefore fishing methods are varied. Most fishing takes place in the salt water and the NT’s tides have to be taken into account. Lure colour and size are greatly debated but there is no doubt that some days barramundi will show preference for certain lures and colours. At times the fish will feed on a specific food item and a lure will need to imitate that item to get strikes. 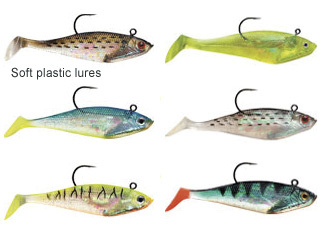 Tiny lures can be useful at times, especially during the wet season run-off. Small prawn imitations are very effective in the saltwater as even large barramundi are voracious eaters of small prawns. The main consideration is that the lures are strong – barramundi will literally tear apart lightly built lures. 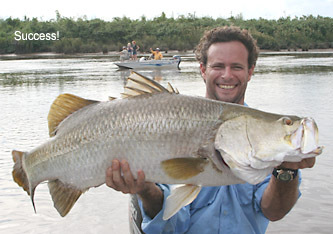 Fortunately there is a huge range of strong lures available specificially for barramundi fishing. 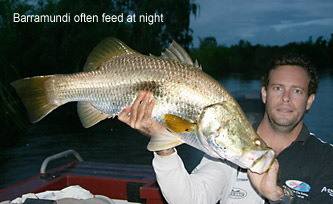 The soft plastic lures or "jellies" are very effective on barramundi. 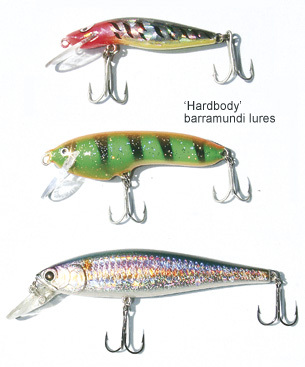 Click on the following link for more information about barramundi fishing lures.